Okay so I saw this editorial by Peggy Noonan when it came out last Friday. (Hat tip to Blue Texan at Firedoglake for flagging it and doing a great piece about it.) But at the time, I told myself, 'just ignore it, think happy thoughts,' because really getting into the muck of what's going on with this editorial was just gonna make me mad. Then Nascar lovin' multimillionaire newscaster Brian Williams wrote on his blog that not only did he like Noonan's editorial but he thinks Noonan deserves the Pulitzer Prize. Which caused steam to shoot out my ears so now I'm here writing a blog post instead of watching Survivor. Let me just take a moment to break down why Noonan's original editorial is so problematic and what it says about the Wall Street Journal, Brian Williams, and the modern Republican Party. Yeah because it's not enough that Barack Obama already idolizes Ronald Reagan, he also has to get teary eyed over slave owner George Washington and neo-Nazi Henry Ford -- the guy who was actually cheering for Germany to win World War II? "[Obama has been portrayed as] the candidate who loves America because of the great progress it has made in terms of racial fairness. Fine, good. But..."
Noonan is going out of her way to remind Obama that this is not just the country of Martin Luther King and Cesar Chavez but also the country of the Middle Passage, Jim Crow, and the KKK. This editorial is the worst kind of sneering Republican country club racism and the sort of coded dog whistle politics that white southern voters love to hear. For Brian Williams or anyone else to praise this vile race baiting editorial as good journalism is incomprehensible. 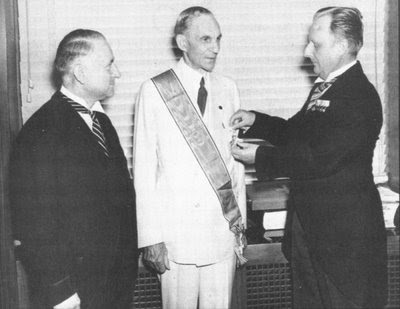 Henry Ford receives a medal of honor from the Nazis (hat tip Blue Texan writing at Firedoglake). Also, be sure to check out Glenn Greenwald's article on this whole sordid mess. And the crazy thing is, for all I know, Obama really does get all misty-eyed thinking about Henry Ford and vile Republican hate merchants like Peggy Noonan -- because he's an amazing human being who goes out of his way to see the best in people. But of course, Noonan's too busy telling Obama to smell the glove to notice any of that.